← I never mix my pies. Throw more brandy. I understand my tests are popular reading in the teachers’ lounge. So that went well, I think. Finals were yesterday, and while I don’t know that I distinguished myself, I think it is safe to say I’ve passed the class. You will, of course, be the first to hear the squee when grades are posted. I’m SO glad to be done with intercession schoolwork. Things start up again on Monday with a fresh batch of classes. I’m doing 16 units, but these are all at the regular pace and so only the normal, acceptable level of overwhelming. Still, I am just starting to really grok how much I am not going to have a life for the next 4 years or so. Ah well. The goal is worthy and if not now, when? That, my friends, is the Box O Shame. Or actually it’s the Tea Tray O Shame, but that doesn’t scan quite as well. I went through and found all the unfinished objects and while there aren’t as many as I’d feared, there’s enough. Four pairs of socks, a couple of handspun scarves, a lace stole, a sweater, and a hat. 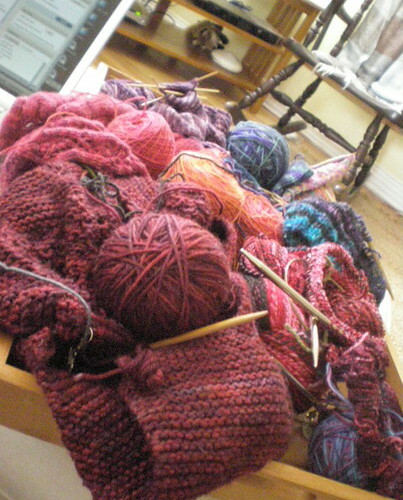 So now they’re all in my knitting basket and I’m going to try to finish them. Actually one of the pairs of socks may get frogged, but otherwise, they get done before anything new gets cast on. I’m a little worried that by the time I graduate, I won’t have had time to get started on any of the other sweaters, projects and goodies that I’ve got queued. But I guess that just gives me something to look forward to, right? Today is officially a Day Of Rest. I’m going to give the cats and Tiki all a good brushing, catch up on Battlestar Galactica, and go through my stash for odds and ends to donate to a friend’s child’s class (they are weaving and need yarn, BOY did they come to the right place!). I am not going to get out of pajamas. Tomorrow I am going to do my laundry and clean my house. At some point this weekend I have a vague plan to get together with my study buddy from the intercession and there will be salty snacks and drinking**. We haven’t decided if we’re going out for beers and fries or margaritas and chips, but there will be a taxi, there will be alcohol, and there will be salty snacks and plenty of ’em. Because, we earned it. Boy did we ever! I will get out of pajamas for that part. Beer and salty snacks make it seem worthwhile to actually put on pants. Hope all y’all have a fantastic weekend with the people you like best, doing the things you like to do. And may a certain screenwriter find his never ending bowl o’ popcorn drenched with real butter today. **People who don’t know me in person might not know that “drinking”, in the HoneyAndOllie-verse, means “I’m going to have a beer and fall asleep now. Actually, I will probably have half this beer and you can finish it after I begin snoring.” I am what you would call a “cheap date” in some circles. But I don’t mind. It means I don’t spend as much when I go drinking because a beer lasts all night, and I never get stupid and sloppy. One of the little buggy things about the ex Mr. Honey and Ollie moving out was that now bottles of wine usually go off before I can finish them. I like wine, I like drinking wine, but I can’t drink it very fast or much at a time. Some people are of the opinion that wasting wine is alcohol abuse. I would tend to agree. Ah well. We all have our trials and tribulations. This entry was posted in Family Life, knitting, Strings, Sticks and Wheels. Bookmark the permalink. 3 Responses to I understand my tests are popular reading in the teachers’ lounge. My kidlet is off with MIL and my husband is off doing his thing -I’m still in my pjs and reading Shambhala Sun articles online. The only thing remotely useful I’ve done all day is cleaned the cat box & hung up a load of laundry.. its definitely a lazy day. Oh the four years will be so worth it. I went back to school at 40 years old and had a great career after that. It was so worth it. Congratulations on finishing classes and good luck on the next round. I, too, am a cheap date – 1 glass of Merlot and I’m giggling, then the yawns begin, and finally I’m OUT. COLD. Congrats on another term completed!